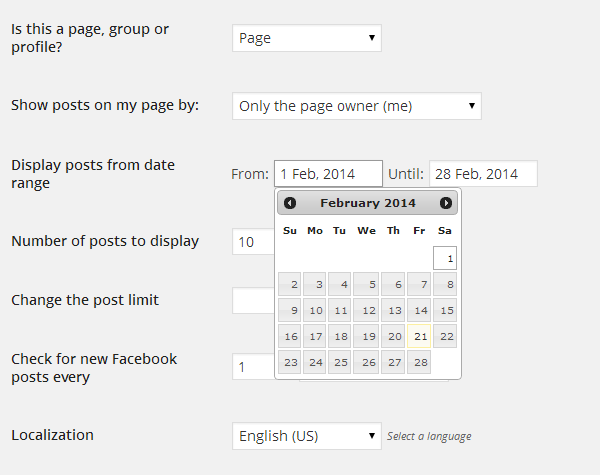 The Date Range extension adds the ability to display posts or events from a specific date range. You can set date ranges to either be absolute (eg: November 1st – November 8th) or relative (eg: 1 week ago – today). The extension give you the power to create daily, weekly, monthly or yearly feeds of your posts using separate shortcodes to display posts from different date ranges in each. See the How to Use tab above for more information and examples of how to use the extension. Below is an example of the Date Range extension used to show events by month. Once activated the extension will allow you to set a ‘From’ and ‘Until’ date range to allow you to show posts or events only from between those specific dates. If you set an ‘Until’ date but don’t set a ‘From’ date then it will display posts from today’s date until the date you set. If you set a ‘From’ date but don’t set an ‘Until’ date then it will display posts from the date you set until today’s date. If you don’t set either then the date range won’t be applied. Relative dates can only be set via the shortcode and not on the plugin’s Settings page. Below are some other shortcode examples.